3. Place bread crumbs, parmesan cheese, parsley, rosemary, garlic, paprika & oregano in a baking dish and stir to mix. Spread the mustard ALL OVER the meaty parts of the racks, using a spatula. Then, dredge the lamb into the crumb mixture to coat on all sides with the crumb mixture. Make sure the meat is evenly covered and sprinkle some of the crumbs and pat them with your fingers. 5. When ready to cook, place the racks in the center or over the burner that is NOT on “meat side up” for 25-35 mins (for medium rare) and if using a meat thermometer, it should register about 145 degrees. 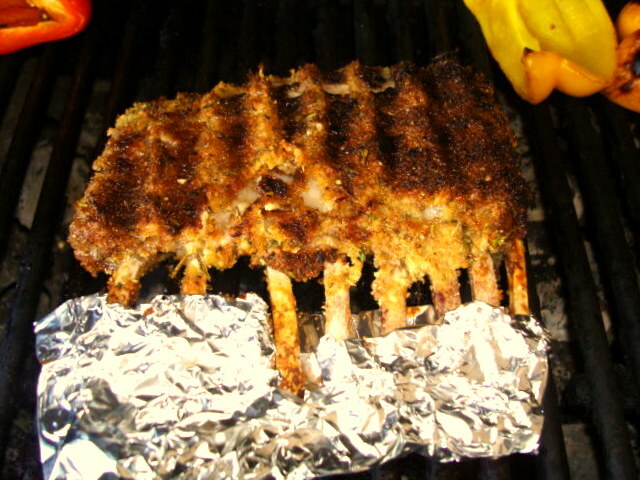 *** Tent the ribs of the lamb with aluminum foil to keep them from burning***. 6. When done, transfer to a cutting board and let it rest for 3-4 mins then cut and serve. 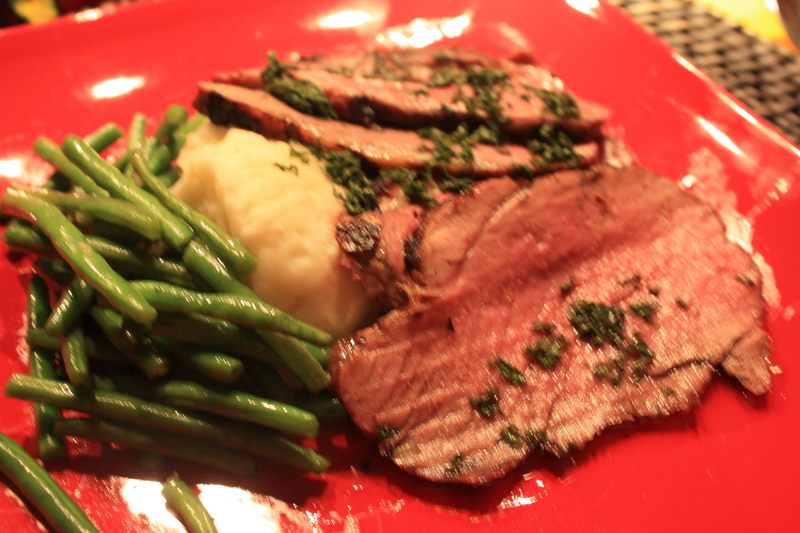 Grilled Boneless Leg of Lamb!!! Mix it all together. It yields about 1 cup. get (2) -1 gallon zip lock bags and put one in each bag and then split the marinade and put that into the bags, then take the air out of them, swish it around and put in fridge. Marinade it anywhere from 4 hours to overnight…whatever you choose! I did it for 6 hours and it was perfect. Heat the grill on “high” with all burners. Sear for about 4 mins and then turn over and do the same for the other side. Now lower the grill temp to 300-350 degrees and I turned off one burner and put the meat on that, then closed the lid and cooked for 30-35 mins or until a meat thermometer, inserted into the thickest part, reads 130 for medium rare. Take off the grill, put on a platter and cover with foil and let it rest for about 10 mins. Then carve away! I love mint with Lamb…so, my friend Bernie (who was very instrumental in this recipe) gave me a simple one that she uses. Mix water and sugar and put in to a sauce pan and stir until dissolved. Then add gelatin followed by chopped mint leaves. Stir and then remove from heat. When meat is sliced, drizzle sauce over meat and then serve!! YUM!